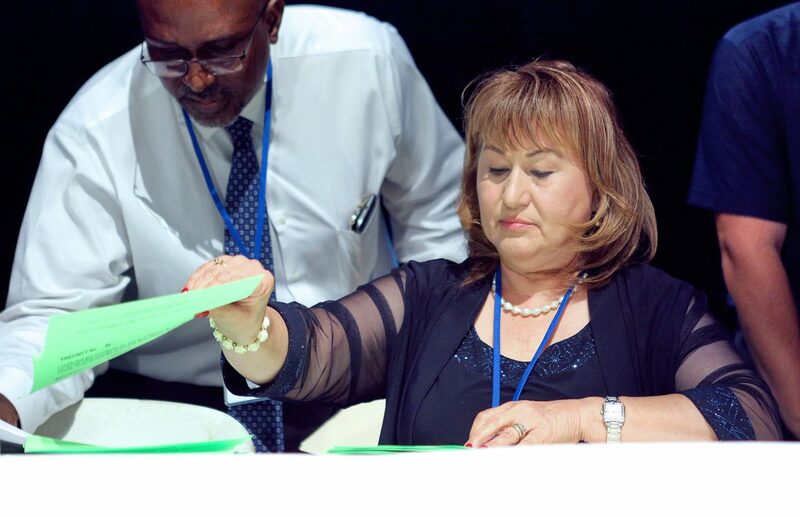 Norma Ramirez, chair of the Hidalgo County Democratic Party, counts the ballots as the Hidalgo County Democratic Party precinct chairs nominated the Democratic candidate for 93rd State District Judge at the Edinburg Municipal Auditorium on Friday, June 29, 2018, in Edinburg. EDINBURG — Three decades later, a retired district court judge is the Democratic candidate for the same court he once presided. Hidalgo County Democratic Party precinct chairs voted Friday to nominate Fernando Mancias as their candidate for 93rd state District Court on November’s ballot. Whether Mancias, 64, will face a challenger remains to be seen. 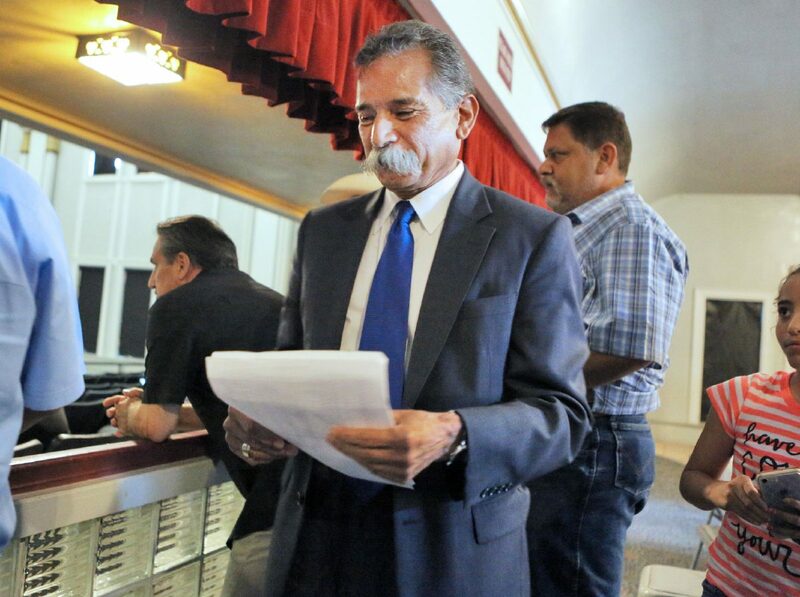 The Hidalgo County Republican Party has yet to nominate a candidate of its own for that election, which was triggered by the April resignation of ex-state District Judge Rodolfo “Rudy” Delgado. Mancias presided over the 93rd District Court from 1989 to 2000, ultimately retiring to return to private practice. Delgado won the election for Mancias’ seat, serving from 2001 to February of this year, when he was suspended from the bench following his arrest on several federal bribery charges. 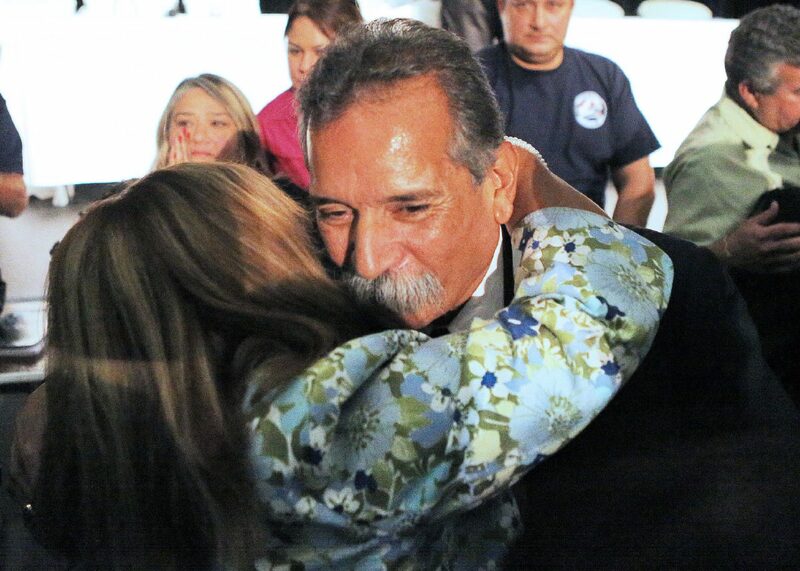 Fernando Mancias is congratulated by well-wishers after Hidalgo County Democratic Party precinct chairs nominated him to be the Democratic candidate for 93rd state District Judge at the Edinburg Municipal Auditorium on Friday, June 29, 2018, in Edinburg. 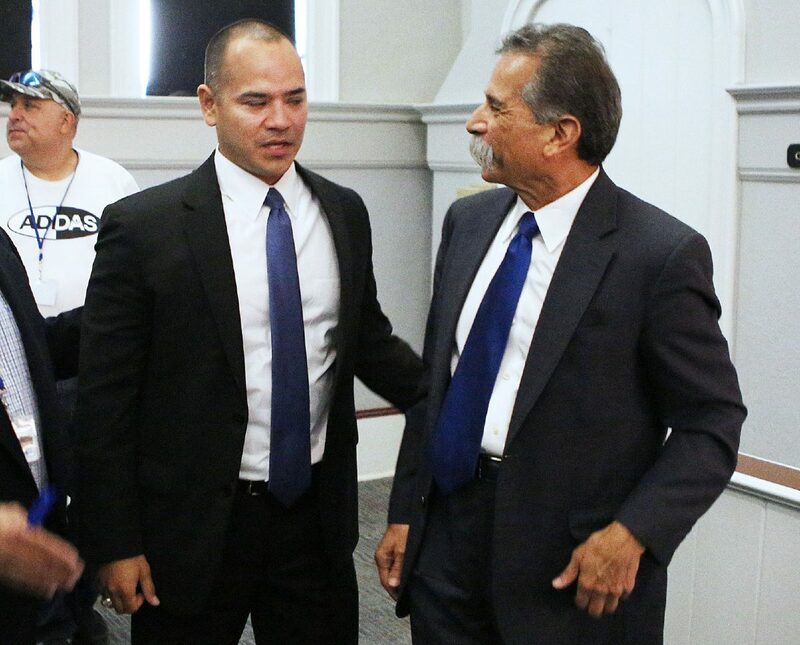 Judicial canidates, Ted Lopez, left, and Fernando Mancias talk after Mancias won the position after Hidalgo County Democratic Precinct Chairs nominated him as Democratic candidate for 93rd state District Judge at the Edinburg Municipal Auditorium on Friday, June 29, 2018, in Edinburg. 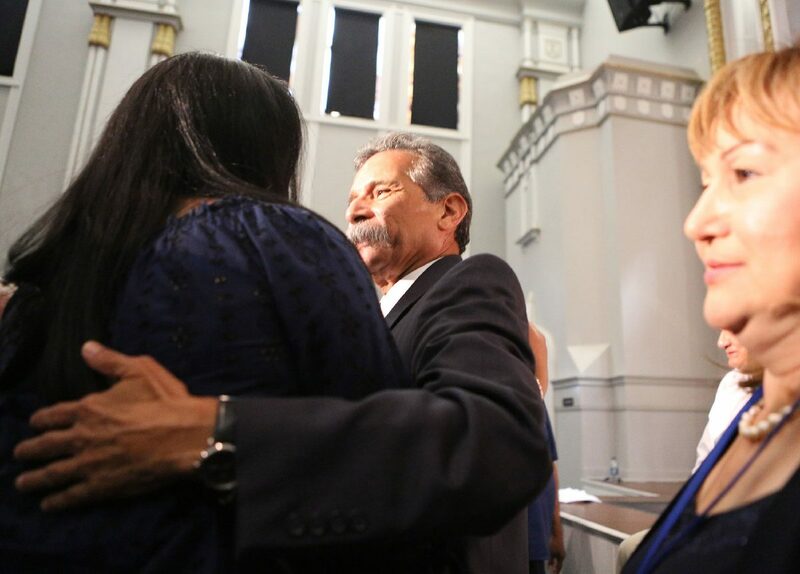 Fernando Mancias smiles moments after winning the the Democratic nomination for 93rd state District Judge during a party meeting at the Edinburg Municipal Auditorium on Friday, June 29, 2018, in Edinburg. 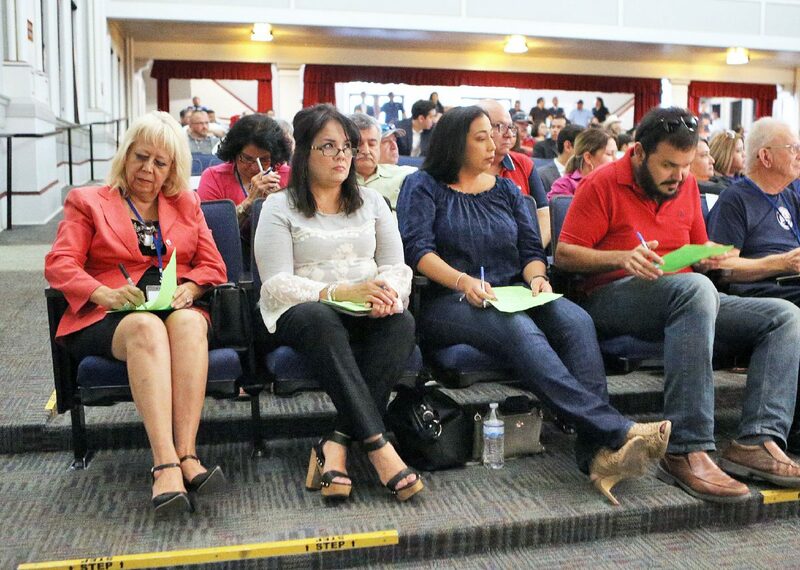 Hidalgo County Democratic Party precinct chairs cast their vote for the nominee for 93rd state District Judge at the Edinburg Municipal Auditorium on Friday, June 29, 2018, in Edinburg. “I’m very happy that so many people decided to participate and speak their mind and vote their conscience,” Mancias said, adding that he worked “really hard for the last two and a half months” to secure the nomination. Sixty-one of the 69 precinct chairs were in attendance for Friday’s vote. Mancias was vying for the nomination against three other attorneys: Teodulo “Ted” Lopez, former Hidalgo County Democratic Party Chair Ricardo “Ric” Godinez and Edinburg school board member Juan “Sonny” Palacios Jr.
None of the candidates received a majority of the vote, triggering a second round between Lopez, who received 13 votes in the first round, and Mancias, who received 28. Democratic Party Chairwoman Norma Ramirez said she was pleased with the nomination process, which she described as organized, transparent and efficient. Whoever is elected as 93rd District Court judge this fall will take the bench in January 2019 and carry out the remainder of Delgado’s term, which ends in 2020.